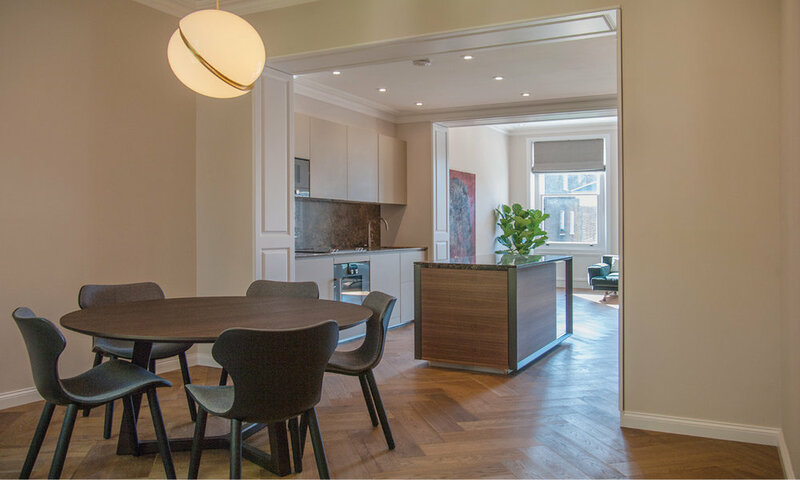 Bramham Gardens is a complete conversion of a two-bedroom flat in London. All interior walls were removed and a new floorpan was implemented with an innovative load-bearing structure and utilities. 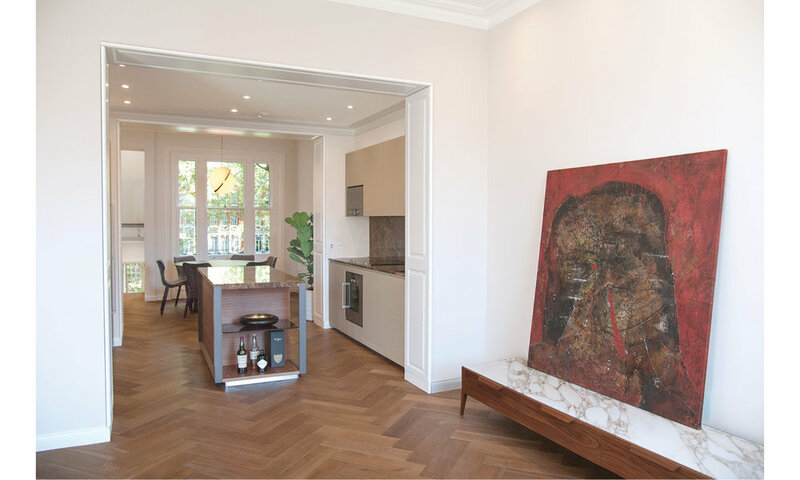 The apartment now has a larger usable floor area with ample and luxurious rooms, resulting in a significant increase in property value. The old apartment had an unfortunate layout: long, dark hallways, an excess of doors, narrow rooms, low ceilings and big cabinets of poorly hidden technical installations. The bedrooms were crammed along the street-facing facade, lacking privacy and directly exposed to noise. 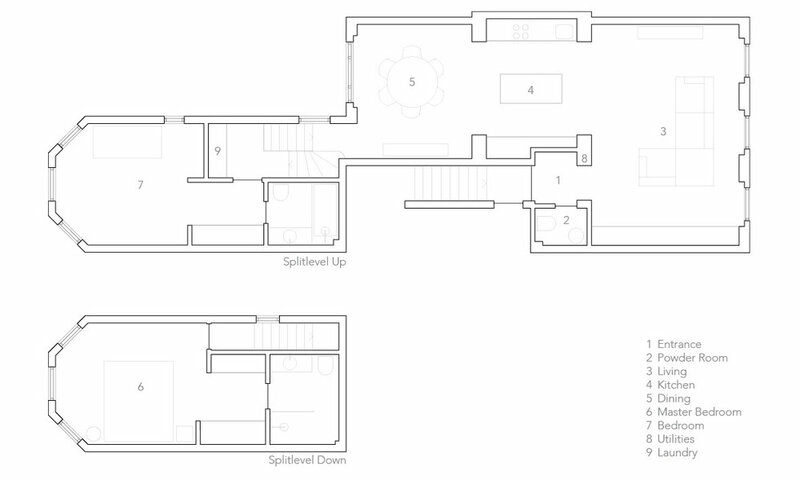 The living areas were split on two floors towards the back of the house, leaving only a small downstairs area for the main living room, cornered under a staircase. 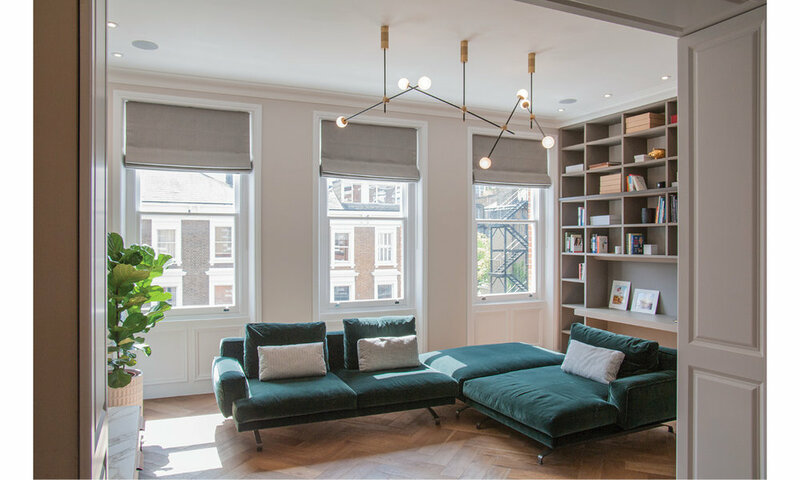 Raumeinheit decided to switch the public with the private areas: the bedrooms were moved to the back, each now with an en-suite bathroom and facing the beautiful Bramham Gardens. The rest of the apartment was opened up completely into a single open living area. Protruding walls, archways and a discreet variation in ceiling heights structure the open space into distinct living, kitchen and dining areas. 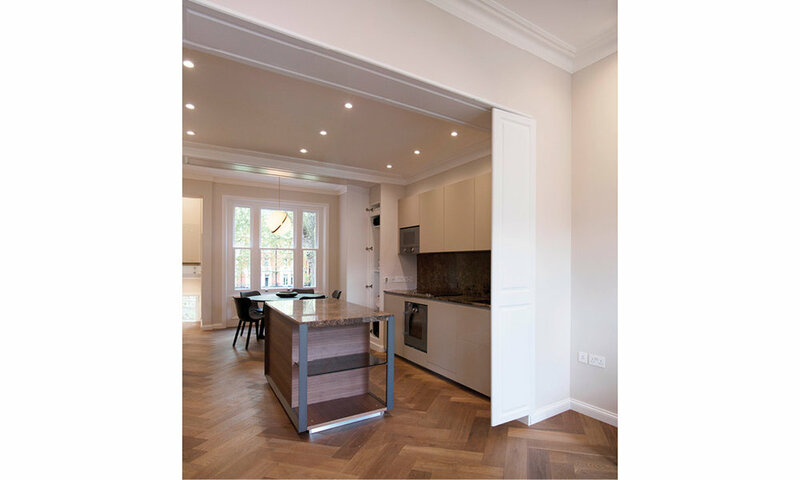 A requirement for this open-plan was a new load-bearing structure with cantilevering steel beams above the new kitchen. In addition, the front door was relocated in order to create a proper entrance area and powder room. In the effort to maximize utilization of space, much attention was given to finding individual spatial solutions for technical equipment and storage. As a result, the apartment turned from a mediocre assemblage of small rooms into a spacious residence with architectural solutions that are usually not possible in properties of this size.